Pure Ballast 3.1 is the new generation of leading technology, improved with the knowledge only real-world experience provides. Though 50% smaller than its predecessors, it uses up to 60% less energy and handles flows of up to 6000 m3/h. Pure Ballast, the system that first led the way in ballast water treatment, is once again defining the cutting edge. In Pure Ballast 3.1, every aspect has been re-examined, including the reactor, which has been rethought both inside and out. While the treatment principles remain unchanged, the optimized construction and flow let one energy-efficient reactor do what four reactors did before. With its optimized reactor design, PureBallast 3.1 offers a minimum energy savings of 30% over its predecessor. Operating at a full power of just 100 kW per 1000 m3/h, it can also be “dimmed” by up to 50% when water quality allows. This automatic function potentially doubles your energy savings – to as much as 60% over the previous version. Pure Ballast 3.1 comes with the assurance only a global marine supplier can provide. Active in ballast water treatment from the beginning, Alfa Laval is present all over the world. 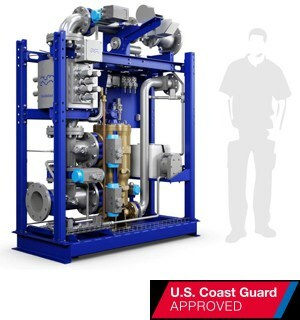 That means easy access to parts, service and advice – in ballast water treatment and beyond.